WizNote is a good cloud-based note-taking app with comfortable blue interfaces. It helps you remember all your schedules anytime and anywhere. In this prototype, a special label bar at the bottom is really worth learning. With Mockplus, you can easily get such special-shaped labels simply by using “Circle” and “Shape” components and grouping them together then. Moreover, to reuse such special DIY components freely in the future projects, you can directly save them to your component libraries by right-clicking them and select “Add to my libraries”. And then, if necessary, it is recommended for you to sync your libraries so that you can freely download and use them anywhere and anytime. 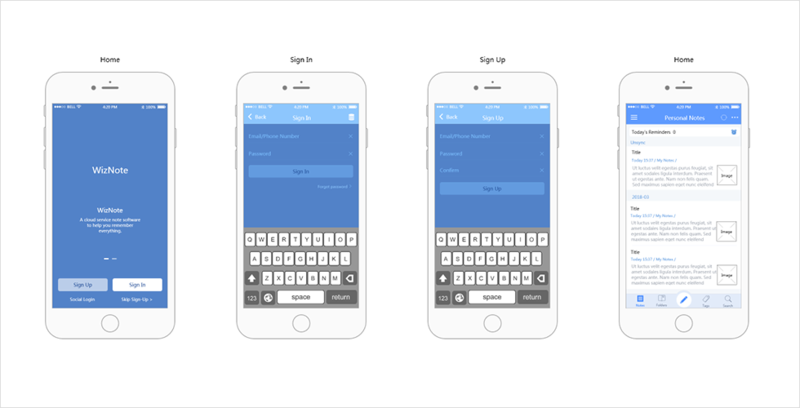 Pages of this prototype: Sign In, Sign Up, Home, Add, Search and User Info, etc.